Thanks to its progressive policies, New York ranked tenth in the country for cumulative solar installed last year. In 2016, Governor Andrew Cuomo’s Clean Energy Standard gave the state a target of obtaining 50% of its electricity from renewables by 2030. To reach this goal, Cuomo recently announced that the state is pouring $1.5 billion into renewable energy projects. This investment is in addition to the state’s existing solar incentives, which, along with the Federal Income Tax Credit of 30%, already make going solar in New York very attractive. However, many of the existing incentives for residential solar in the state are running out, so if you’ve been waiting to go solar now is the time! Like many other states around the country, New York offers net energy metering (NEM). Under NEM, utilities credit homeowners for the electricity their system generates in excess of their household usage. This electricity flows back to the grid, helping to power the rest of the community and saving utilities money because they do not have to procure other power sources. Utilities generally credit homeowners at the prevailing retail rate against their future usage. Qualifying New Yorkers can also take advantage of the the Federal Income Tax Credit (ITC), which amounts to 30% of the gross cost of the system if bought with cash or a loan (read all about it here). The New York State Energy Research & Development Authority's (NYSERDA) NY-Sun Incentive Residential Program applies to systems under 25 MW and is separated into three different regions throughout the state: Long Island, Upstate, and regions served by Con Edison. Each region is separated into different, declining incentive block levels corresponding to total megawatts of solar installed. The charts above show the three regions and their current block status. For example, the Con Edison has 9 blocks, each with a unique MW capacity, and is now in Block 7. 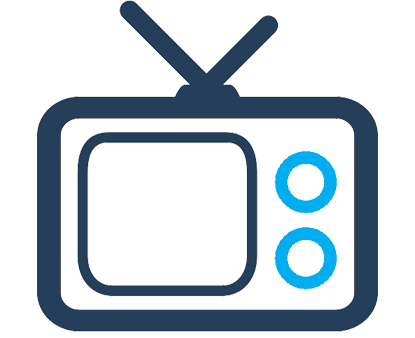 Once the target of the current block is hit, incentives are distributed in accordance with the next block’s regulations (see the realtime block here). 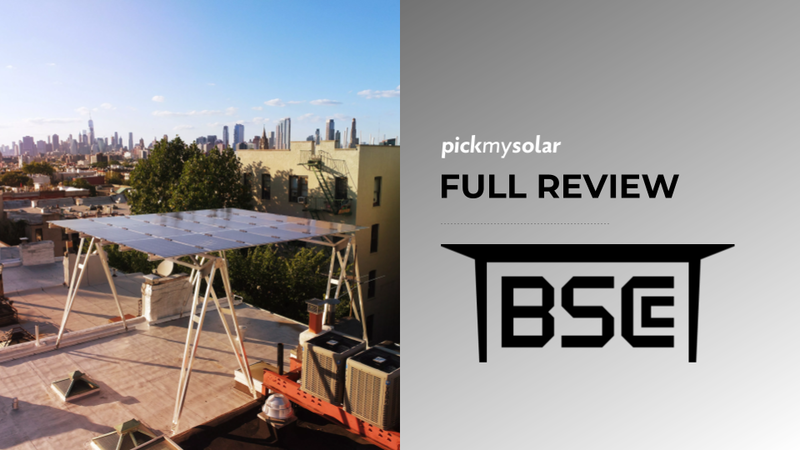 Here's an example of how this works: John lives in New York City, a Con Edison Region, and recently purchased a 5kW solar-electricity system at $3.50/watt for $17,500. 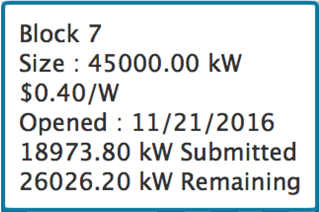 He went solar in Block 7, meaning that his incentive was $0.40/Watt incentive (the details for Block 7 are shown below). John therefore received $2,000 in his initial rebate, bringing his total system cost down to $15,500. If John had waited until Block 7’s target capacity of 45,000 kW was reached, his incentive would be allocated under Block 8. John would receive $0.30/W instead, meaning that his system cost would be $16,000 and that he forewent $500. When all blocks for a specific region have been filled, incentives in that area are no longer available. This is the case with the Long Island Region. 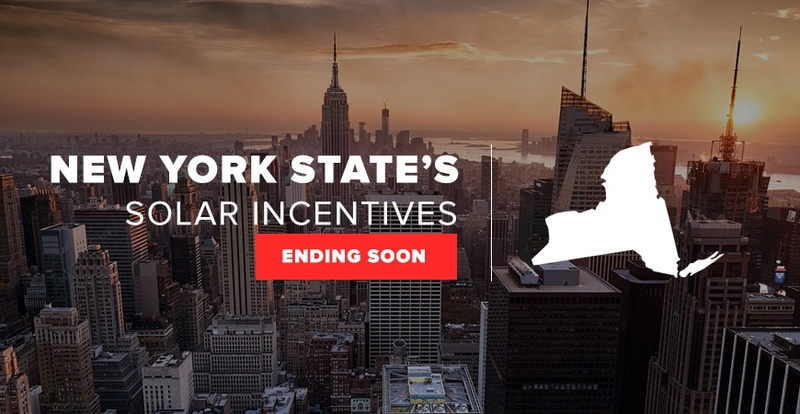 Because the area’s total MW installation goal has been met, residential incentives under the NY-Sun Incentive Program are no longer offered for homeowners in the region. For homeowners looking to go solar in the Upstate or the Con Edison Regions, now is the best time to start the process. Incentives per kW are higher now than they will be for any future blocks, so taking advantage of the maximum potential value requires going solar today. Though Long Island residents can no longer take advantage of the NY-Sun Incentive Program, they can still take advantage of the various other incentive options. 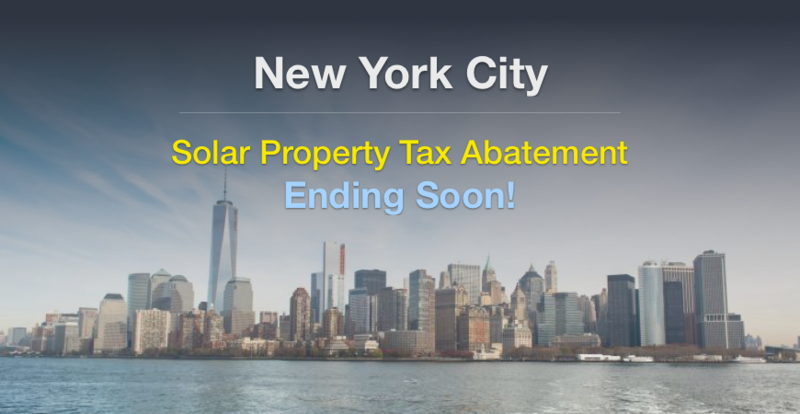 New York offers a Residential Solar Tax Credit for the gross cost of a solar-electric or solar-thermal system. This tax credit is equal to 25% of gross system cost, which encompasses design, planning, equipment, and installation of the system. Total tax credit is capped at $5,000. Credit in excess of taxpayer liability can be carried over for up to five years. Unlike the Federal ITC, the Residential Solar Tax Credit applies to lease and PPA financing as well as loan and cash sale options. The tax credit is only applicable if the system is installed on your primary residence. Eligible residential, metered systems cannot exceed 25kw. However, condominiums and cooperative housing associations can have up to a 50kw system. This credit does not apply to any portion of a system provided by a non-taxable federal, state, or local grant. John’s 5kW system, after his Con Edison Region incentive, costs $15,500. 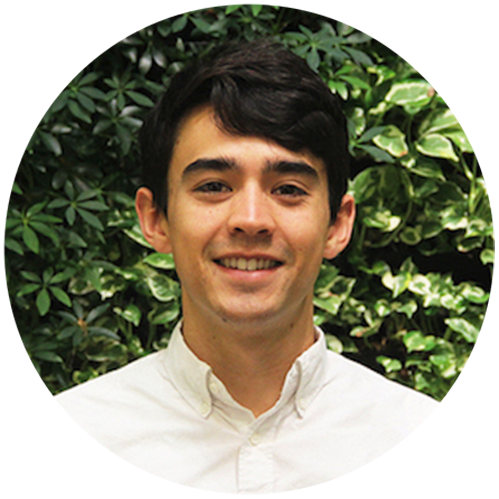 Because he is eligible for the Residential Solar Tax Credit, he will be credited 25% of his system cost, or $3,875 that year. This is an addition to the Federal Investment Tax Credit, which is 30% of his system cost or a credit of $4,650 for the year. 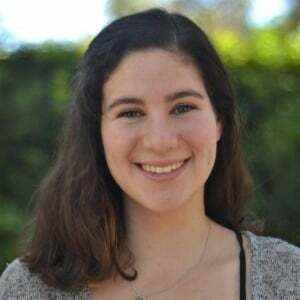 In 2008, the state passed legislation providing property tax abatements to residents who install solar and live in cities with populations greater than 1 million. 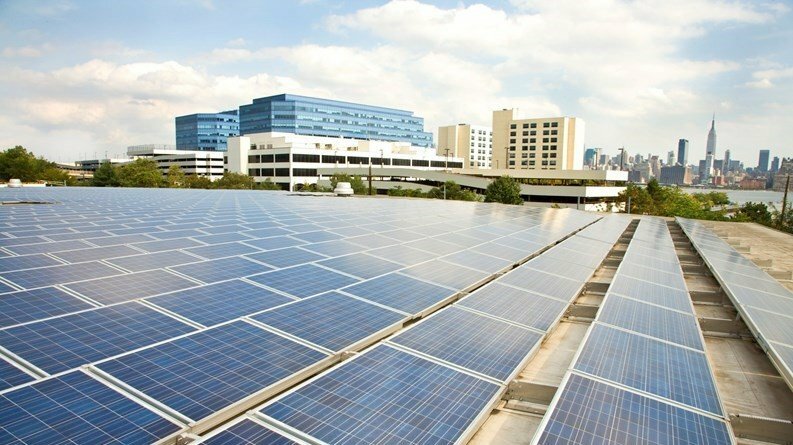 The only city in the state with a qualifying population is New York City, so only residents of the Big Apple to are eligible for the city’s property tax abatement for their photovoltaic system costs. 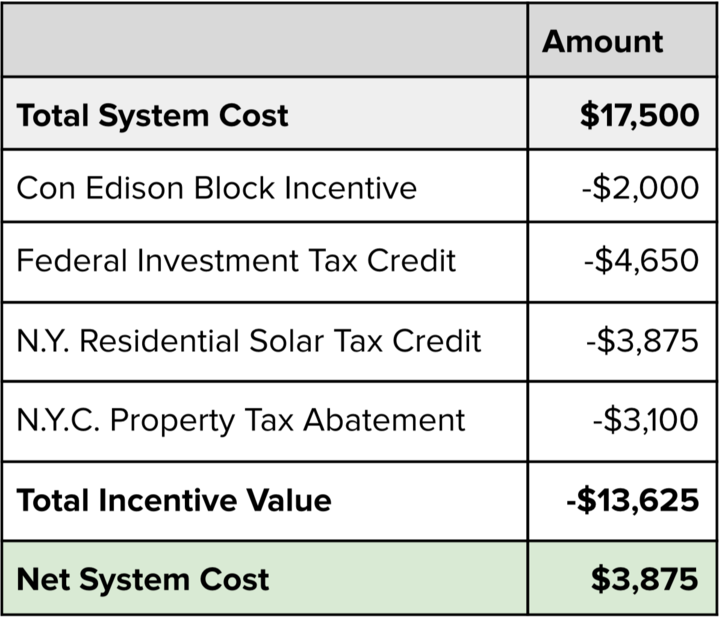 New York City homeowners who go solar today can deduct 5% of qualifying expenditures from their total real property taxes for 4 years. The program is capped at $62,500 per year and does not allow for unused balances to be rolled over into subsequent years. The tax abatement program was extended in 2016 until 2019. John’s tax abatement amount is calculated using his system cost after the Con Edison rebates, meaning that he can deduct 5% or $15,500 or $775 for four years, for a total deductible of $3,100. It should be noted that this rebate does not directly work towards lowering the system amount, but John still takes advantage of the savings overall. Altogether, John was able to take advantage of $13,625 in incentives and rebates. His net system cost after incentives, not even including his savings on his electric bill, is $3,875! 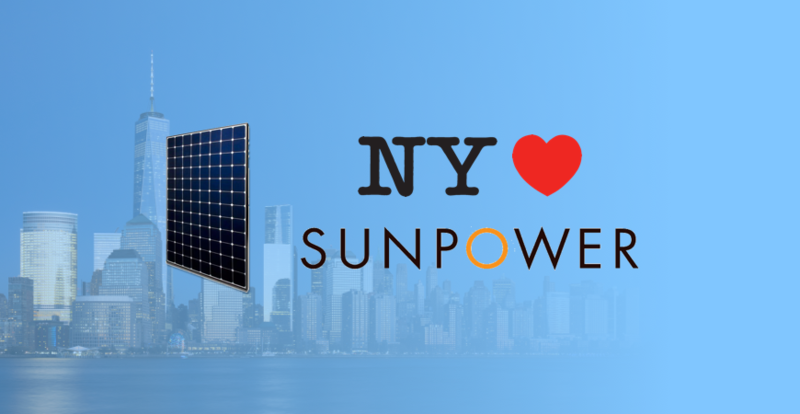 If you’ve been considering going solar in New York, don’t wait any longer! Many incentives are set to expire in the near future and the incentives prices in the NY-Sun Incentive Residential Program are declining. 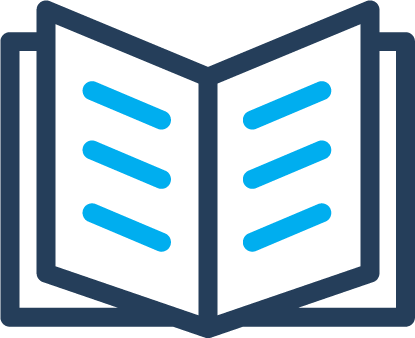 To get started today, get instant cost and savings estimates for solar for your home by searching your area using the button below.